Time is running out for the greatest ocean liner ever built, and a unique and unusual piece of American history. She was, and still is, a record breaker. She was the fastest passenger ship ever built at the time of her launch, and her record has yet to be matched, more than 50 years later. Her design, pushing 60 years old, is still superior to any other passenger vessel built before or since. 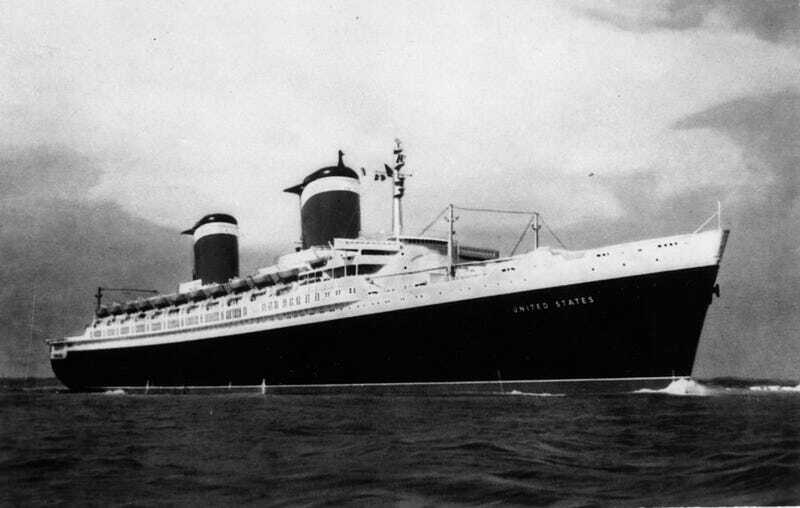 The SS United States was perhaps the last great thing that this nation ever built; the last thing that we created that had an actual connection not just to a handful of fat, wealthy retirees, but to our nation's very soul. She is the last example of what happens when Americans take pride and interest in the world around them, and what we are capable of achieving if only we cared enough. Right now, there are still a handful of people who care about the SS United States, and they are trying to save her, restore her, and give her a new life as a museum ship. But, at this point, they are in dire trouble. The ship will be sold for scrap in two months if they are unable to raise $500,000 in that time. Once that ship is scrapped, there is no undoing it; there is no reset. She's gone for good, never again to be anything but a distant memory and perhaps a collection of soup cans. Just ask the French, who lost their great liner, the SS France, how much they regret their loss. This is an important ship, an important piece of American history, and a source of national pride. Help save the ship. Even if all you have to donate is a dollar, please do. There is this common perception out there that one dollar from one person can't possibly make a difference, and it's not true; it's just a self-fulfilling prophecy based on diffusion of responsibility. We are, all, of us, responsible for this ship, and we can all make a difference. When it comes to the fate of this ship, you matter. Your single dollar, if that's all you can spare, matters. We can work together to save the ship; to save one of the few remaining pieces of our national pride. I don't normally go in for this sort of thing; in fact, I hate this sort of thing. I hate the philosophy and the act of trying to sell something like this. I hate it so much that the last time I did it was when I was a boy scout selling popcorn and candy (which, to those of you who have done the same, should be justification for my hatred of it). But I'm doing it now, because I think that saving this ship is truly that important. Please help these guys save the SS United States.